Mainz-based researchers have made significant advances with regard to the development of individualized immunotherapy strategies for treating cancer. They have managed to identify the relevant genetic changes or mutations associated with various types of cancer and have determined their individual blueprints. This makes it possible for the scientists to readily produce customized cancer vaccines of the kind that have already been demonstrated to be effective in animal models. Here they have proven effective in the regression and even elimination of experimental tumors. Headed by cancer researcher Professor Ugur Sahin, participants in the successful project included researchers at the biopharmaceutical research institute TRON – Translational Oncology at the University Medical Center of Johannes Gutenberg University Mainz gGmbH, the biotech company BioNTech AG, the Mainz University Medical Center, and the Californian La Jolla Institute for Allergy and Immunology in the USA. Their results have recently been published in the journal Nature. Unlike the conventional methods of treating cancer, i.e., surgery, chemotherapy, and radiotherapy, cancer immunotherapy uses the immune system to fight cancer. "We now know that our immune system itself is able to recognize cancer and take steps to fight it," explained Professor Ugur Sahin. "Unfortunately, it is not usually capable of controlling a tumor. One obvious strategy is therefore to stimulate the immune system in such a way that it is able to restrict tumor growth and to destroy malignant cells." It has also long been known that each tumor has its own individual genetic fingerprint that includes numerous genetic alterations. The innovative concept of individualized cancer immunotherapy aims to identify these mutations in a tumor, to decipher its genetic blueprint through sequencing, and – using this blueprint as a template – to produce a synthetic vaccine that is specific to the tumor and thus to the patient. This vaccine will then supervise and train the body's own immune system so that it is able to fight the cancer in a targeted manner. "The implementation of this promising approach has to date been hampered by the fact that tumor mutations differ greatly from patient to patient, meaning that it is a very complex procedure to create vaccines on demand," added Sahin. "Through our recent research, we have found a way to bypass this problem and demonstrate what form a practicable strategy with acceptable outlay might take. We describe both fundamental immunological insights and technological advances that should allow us to deliver truly personalized immunotherapy to cancer patients." In pre-clinical experiments, the researchers first looked at the mutations in three different types of tumors – skin cancer, colonic cancer, and breast cancer – and identified their genetic blueprints by means of sequencing. Their objective was to discover which mutations are relevant to immunotherapy, i.e., the mutations that can, in principle, be recognized by the immune system. The Mainz-based team was able to demonstrate for the first time that up to 20 percent of all mutations can trigger an immune response. "We discovered this by keeping an open mind and looking at the entire repertoire of immune defense mechanisms. This was an important factor in our success," said Sahin. "Because, surprisingly, the majority of tumor mutations are not detected by the usual suspects, the natural killer cells, but rather by so-called helper cells. 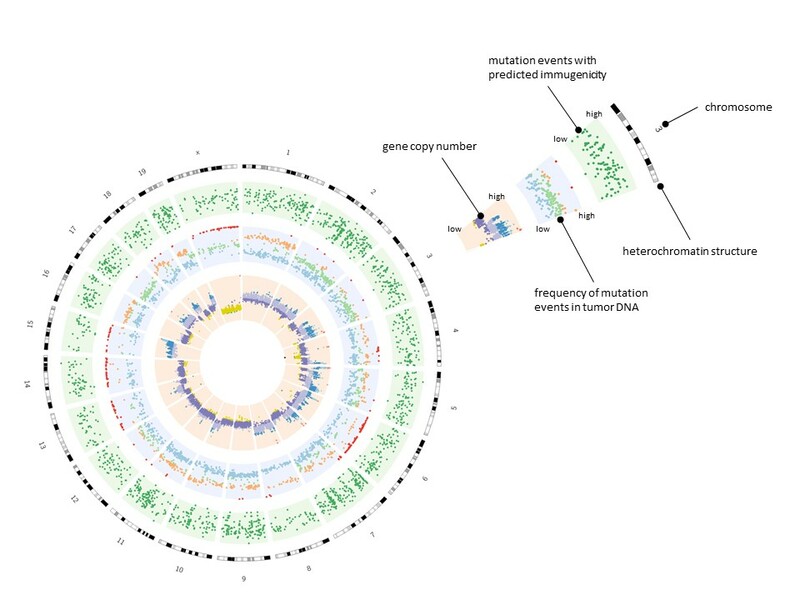 Such a high proportion of relevant mutations, in turn, is important for the broad applicability of the approach, because many tumor types thus have sufficient points of attack and appear to be treatable in principle." In a second phase, the team considered how they could implement these new insights in practice and identify the relevant mutations as simply and reliably as possible. For this purpose, they developed a bioinformatic algorithm. "Once the relevant mutations have been identified, we can use this information to create a customized medication without excessive efforts," asserted Sahin. They decided to use so-called ribonucleic acids (mRNA) to synthesize vaccines. With the help of the genetic mutation fingerprint, these provide a kind of template for the production of mRNA vaccines. The researchers used the genetic information on ten mutations rather than on just a single mutation for the synthesis process so that they would be able to attack the tumor, as it were, in several places at once ensuring that it would be less capable of resistance. In fact, the use of this approach in an animal model resulted in an effective regression and elimination of tumors. The RNA vaccines do not cause permanent genetic modifications to the genetic makeup of tumor cells, but are, to put it simply, eliminated after they have done their work of stimulating and instructing the body's immune system. "All this shows that the on-demand production of customized vaccines to treat cancer is, in fact, possible and practicable," emphasized Professor Ugur Sahin. The researchers were also able to identify matching types and incidences of relevant mutations in human tumors. Their findings are to be further tested in an international clinical study of malignant melanoma in which the Rhine-Main Skin Cancer Research Center of the University Medical Center of Johannes Gutenberg University Mainz (JGU) headed by Dr. Carmen Loquai will be participating. Additional clinical trials are being planned. "We systematically take a translational approach to research," emphasized Professor Ulrich Förstermann, Chief Scientific Officer of the Mainz University Medical Center. "The current research project impressively demonstrates the success of this strategy as it is an example par excellence of the translation of findings into therapy. The results of fundamental immunological research have been converted into a practicable clinical strategy." Professor Babette Simon, Chief Medical Officer and Chairperson of the Mainz University Medical Center, added: "This rapid 'from bench to bedside' development is a unique feature of university medicine. This ensures that we are able to deliver the latest findings from fundamental research to patients as quickly as possible."